Crower Rods are designed using state-of-the-art CAD & F.E.A (Finite Element Analysis). The end result is a rod that is light for it's strength, and stronger than the stock rod. 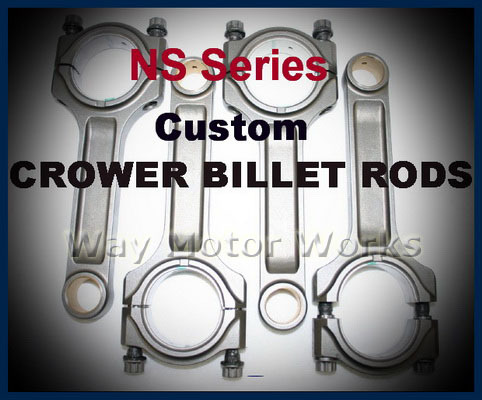 These rods are intended for those building a serious engine where stock strength isn't enough. When you employ a set of genuine Crower rods you do so with the knowledge and peace of mind that each rod will perform flawlessly. While other manufacturers are cutting corners, using inferior or low grade materials, Crower has kept costs down without lowering standards. Crower rods for the Tritec MINI engine incorporate only the finest 4340 chromoly steel. They are heat treated to obtain that perfect balance of strength and durability insuring both quality and reliability. Take a close look at a Crower rod and you’ll notice that it is shaped like no other rod in the industry. Every contour is designed to enhance overall strength and reliability at high engine rpm. Crower connecting rods incorporate an “I-beam” design that eliminates pockets of excess material and delivers exceptional longitudinal and horizontal strength. Tolerances are to an exacting ±0.0001" of an inch to insure trouble free installation.